Discrimination against transgendered people | Ambergoth's Weblog: Politics, Life, LGBT issues, etc. You are currently browsing the category archive for the ‘Discrimination against transgendered people’ category. · The RNLI flew the Rainbow Flag outside their HQ on May 17th to celebrate #IDAHOT – INTERNATIONAL DAY AGAINST HOMOPHOBIA AND TRANSPHOBIA. · They are also signed up as Stonewall Diversity Champions. · This breathtaking hypocrisy is despite the complete whitewash and cover-up by RNLI HQ of a complaint about discrimination against trans woman Kate Mason, who has been fighting the RNLI for over a year after she was rejected as an Education Volunteer by the RNLI Burry Port Station (near Llanelli), on the grounds that “the ‘culture’ of the Station was too ‘macho’ to have a transgender person working with them and there would be ‘gossip’”. No other reason was given at the time for her rejection. · Kate was rejected as a volunteer two weeks after bringing to the attention of the local RNLI management an incident at RNLI Burry Port in which she had been referred to in the wrong gender as ‘this gentleman’ – apparently as a joke at her expense to distinguish her from an RNLI dummy fully dressed in RNLI Boat Crew kit. · Kate protested against her rejection to the local management, and then to RNLI HQ staff, including Chief Executive Paul Boissier, but Kate and her wife were treated as if they were liars and no action was taken against the local RNLI management. Kate was told that ‘the matter is closed’. · Seven weeks later the RNLI’s ‘People & Transformation Director, Heidi Allen, concocted a spurious and untruthful excuse for Kate’s rejection as an Education Volunteer on the grounds that she was ‘highly reactive’. · As a retired teacher with 15 years full-time teaching experience and a former National Trust Tours & Talks Volunteer Guide at Hardwick Hall, Kate had plenty of relevant experience in talking to the public and was well qualified to perform the duties of an Education Volunteer with the RNLI. · Her rejection still stands. Kate has received no acknowledgement or proper apology for what was said and done by the Burry Port RNLI Operations Manager, who remains in post. · RNLI Headquarters are still in denial about the discrimination suffered by Kate Mason. · Kate and her wife have been forced to move from Burry Port as they no longer felt safe or welcome in the local community. · Meanwhile the RNLI Chief Executive gloats on Twitter about flying the Rainbow Flag in support of International Day Against Homophobia and Transphobia. I have been fighting for justice and for the truth to come out since June of this year, but the RNLI has not responded appropriately or effectively addressed the discrimination I have suffered. Instead they have whitewashed the individuals concerned at the local RNLI Station and chosen to believe their lies and misrepresentations. This despite the fact that the RNLI claims to be a ‘Stonewall Diversity Champion’. In April 2015, Trevor Griffiths, the Chair of the Local Management Committee at the RNLI Burry Port Lifeboat Station (which is near Llanelli, South-West Wales) informed my wife they were ‘desperate for help with their educational work’. As I am a retired teacher and I had also been a National Trust Tours and Talks Guide for seven years at Hardwick Hall, North Derbyshire, I was well qualified and had relevant experience, so I was encouraged to put in an application to volunteer with the RNLI Burry Port Station as a ‘Lifeboat Visits Team Member’. On 18th May 2015 we were invited to attend a meeting at the Burry Port Lifeboat Station, where we completed application forms and talked about our experience and qualifications and how we hoped to be able to help the RNLI with their educational work locally. We were introduced as ‘Kate and Jane’, a married couple, and they did not seem to have any problems that we were both women and married to each other, or that one of us was a trans woman. Trevor Griffiths has confirmed that he knew that I was a transgender person at this stage, though it wasn’t discussed. A few days later, for training purposes, we were asked to attend a talk at the Lifeboat Station given by Mal, a member of the Shore Crew. The talk was to a group of local nursery children and their parents. During this talk, Mal made a joke at my expense while referring to an RNLI dummy dressed in full RNLI gear. Although I was not standing very near the dummy and there was no reason to refer to me at all, he pretended he thought it was necessary to distinguish between myself and the dummy, saying that he was referring to the dummy and not to ‘this gentleman’. This apparent ‘mistake’ about my gender was in spite of the fact that he had been previously introduced to me as ‘Kate’, the partner of Jane, and as I have shoulder-length blonde hair and have also had extensive facial feminisation surgery – I do not look much like a man. You will appreciate that his behaviour was very insensitive and embarrassing for me. Burry Port is a small place, and we live just round the corner from the nursery from which the visitors had come. During the later course of his talk, when he had paused for a moment, I waved him over and said quietly to him, ‘not gentleman – lady.’ After the talk Jane and I went straight home, as we did not feel it would be productive or helpful to discuss the incident further with him at that time. We felt that the best way to deal with it was to invite Trevor Griffiths to our home so we could discuss what had happened. Our intention was to talk about it in a friendly, low-key way so as to help them avoid this sort of mistake in the future. Roger Bowen, the L.O.M. (Local Operations Manager) at RNLI Burry Port, invited himself to this meeting. During this first meeting in our own home, Roger Bowen said that Mal realised he had ‘dropped a bollock’ (to use Mr. Bowen’s words). However, Roger Bowen seemed more concerned to let us know that Mal was ‘hurt’ that we had the temerity to bring this up. He did not seem at all bothered about the embarrassment which had been caused to me. Roger Bowen said that before I started as a volunteer, he wanted to get all 21 crew members and ancillary volunteers together and make an announcement to them that a transgender person would be starting as a volunteer. (Some weeks later, this friendly and positive meeting in our own home was untruthfully misrepresented as being ‘highly reactive’ and given as the reason for my rejection as a volunteer. The formal rejection was in a letter from Heidi Allen, the so-called ‘People and Transformation Director’ at RNLI headquarters. A couple of days after the meeting, I had second thoughts about the ‘general announcement’ that Roger Bowen wanted to make regarding my transgender status. I suggested that if he wanted to talk privately to anyone who he felt might be prejudiced or unsure about a transgender person starting as a volunteer, that would be okay with me, but that I would prefer otherwise to talk to people myself about being transgender, if I felt the need or I thought it would be helpful. This seemed to be accepted by Trevor Griffiths and Roger Bowen, and so we anticipated that we would be hearing shortly from them about starting as volunteers. A few days later I received an email from Trevor Griffiths, asking for another meeting. Again, Roger Bowen invited himself to this meeting. They announced that they were rejecting my volunteer application and didn’t even want me to start as a volunteer. The reason given was that, and I quote the exact words used: “the ‘culture’ of the Burry Port Station is too ‘macho’ to have a transgender person working there as a volunteer’. They said there would be too much gossip. I said I didn’t mind what people said behind my back, as long as I wasn’t abused to my face. I mentioned my experience dealing with the public at the National Trust and that I’d had no problems with other volunteers or with staff or visitors at the National Trust property where I had been a Tours & Talks Guide and a Room Guide for seven years. I pointed out that over three years of my time with the National Trust were after I had transitioned, and I had been fully accepted in my female role and it had not cause any problems. It made no difference. Bowen and Mr. Griffiths were not open to further discussion about my rejection as a volunteer. They just rudely marched out of our house, after dropping this on us. I received a single short text back from Trevor Griffiths, saying that they thought they had ‘handled the issue as delicately as they could’. After that, I was informed that Trevor Griffiths had gone on holiday for three weeks (although it was over seven weeks before we received any further communication from him). I felt absolutely gutted, and Jane was on the edge of tears for a couple of weeks after this. No one contacted me from RNLI headquarters or locally until I made this very mild post (above) on the ‘Spotted Llanelli’ website, after which I was telephoned by Sue Kingswood, so-called ‘Inclusion Officer’ of the RNLI. She said she would not have known about the situation if I had not made that post, and thanked me for drawing it to her attention. She was glad that I had done so. NOTHING would have happened otherwise. Sue Kingswood and Matt Crofts (Regional RNLI Officer) came to visit us the following week. They promised us they would deal appropriately with the discrimination I had suffered. They DID NOT deal with the discrimination properly and my rejection still stands. I had to wait seven weeks to get any sort of communication from Trevor Griffiths, Chair of the Local Management Group, which still did not address properly the issues I have raised. All I have so far received from Roger Bowen, the Local Operations Manager at RNLI Burry Port, is a contemptuous and dismissive one-line letter referring to the original incident with Mal, but in no way addressing the substantive issue of my discrimination complaint or acknowledging what was said by Mr Bowen in the two meetings in our home. From the above, it will be clear that I DID try to go through the proper channels in the way I dealt with this. (The RNLI’s Legal Counsel argues that this was not the case, and that because I felt eventually I had no choice but to ‘go public’ by posting on social media about it, this disqualifies me from being treated properly or being offered any sort of resolution acceptable to myself and my wife, because my posts ‘upset’ the local people concerned. It is the RNLI that did not deal with my complaint properly, or in a timely way, and the situation escalated due to the incompetence and intransigence of both the local RNLI personnel in Burry Port and at RNLI Headquarters level. I understand from the most recent correspondence with their Legal Counsel that the RNLI are still not going to deal appropriately and effectively with the prejudice and discrimination I suffered, or withdraw my rejection as a volunteer. They continue to maintain that they believe the lies and misrepresentations of the two individuals concerned at the local RNLI Station, while giving no credence to our account of what happened. The two people have been allowed to remain in post. I have asked the Legal Counsel of the RNLI, Duncan Macpherson, if they could appoint someone from within the RNLI or from an outside agency who is transgender or LGBT, or at least someone who might be more impartial, to liaise with me in order to help achieve a resolution acceptable to both sides. They have refused. I assume from their reply that they have been unable to find anyone who is either trans or LGBT within the RNLI, and can’t be bothered to contact an outside agency. How many RNLI salaried staff and RNLI volunteers are from religions other than Christian or of no religion (they must surely have at least this information in relation to lifeboat crews who risk their lives, as they would need to know their religion in the case of death or mortal injury). How many RNLI salaried staff and RNLI volunteers are registered disabled. I am not very sanguine that any such statistics from the RNLI will be forthcoming or that they have even collected such information (as local authorities commonly do), but I can but try. The RNLI Burry Port Station is not unusual. The RNLI as a whole is a very white, very ‘traditionally gendered’, very heterosexual organisation with very few women (whether trans or not) in active roles as Shore Crew or Lifeboat Crew. In fact I was initially only applying to be an Education Volunteer, for which I was well qualified, but my rejection as Shore Crew was equally emphatic. In the case of the local Burry Port Station – the RNLI is also very Welsh – run and managed by just four local Welsh families, who run it as their personal fiefdom and each occupy 2-3 roles at RNLI Burry Port. This ‘closed-shop’ situation is by no means unusual in RNLI Lifeboat Stations in Wales, or more remote stations in England and Scotland. (Sue Kingswood, RNLI Inclusion Advisor, has admitted this to us.) The RNLI needs radical reform. It needs to be pushed to join the 21st century and accept and welcome the diversity of modern society in the U.K. It is HIGH TIME the RNLI started to implement their own Inclusiveness Programme, and earn the right to be ‘Stonewall Diversity Champions’, which they claim to be. 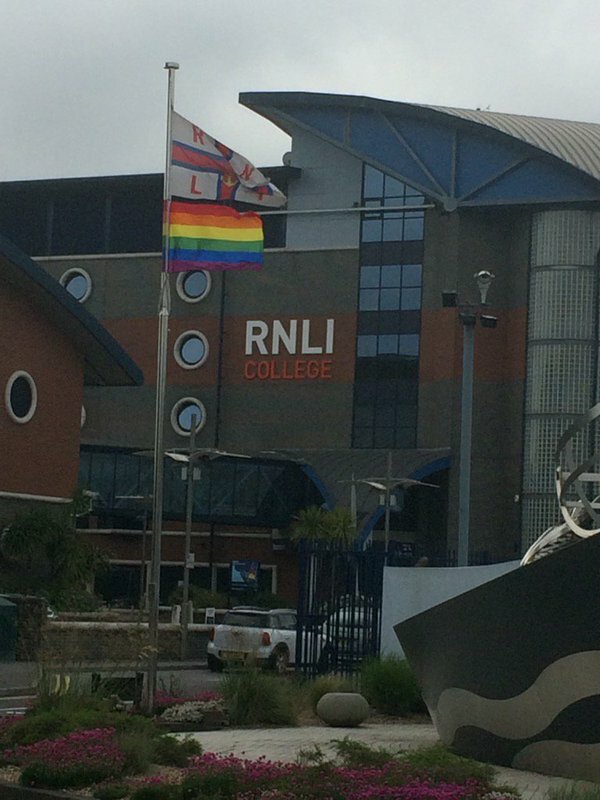 Unlawful Transphobic Discrimination at the RNLI – they are getting away with it! Some weeks later, in order to justify their rejection of Kate Lesley, they lied about this and denied what they had said, although this was also witnessed by Kate’s wife, Jane. RNLI Headquarters then compounded the situation by failing to deal effectively with this discrimination. Instead, they actually whitewashed the two individuals concerned at RNLI Burry Port and supported them in their misrepresentations about what happened. The RNLI next fabricated a spurious excuse for Kate’s rejection, claiming that they were rejecting her because of her reaction to a previous incident when a member of the shore crew tactlessly and insensitively referred to her in the wrong gender – as ‘this gentleman’ – although he had previously been introduce to her as ‘Kate’. This was supposed to have been a ‘genuine mistake’ (you can decide for yourselves how likely this is by looking at the photos of Kate on this blog – she doesn’t look much like a man, does she?). It was very embarrassing at the time as it was in front of a group of parents and children from the local nursery, just up the road. Burry Port is a small place. After inviting the RNLI Burry Port management to discuss this incident in a friendly way in order to help the Station avoid a mistake of this type in future, nothing happened for a couple of weeks, and it was assumed that Kate’s and Jane’s written volunteer applications were being processed and they would soon be starting their volunteer roles with the RNLI. It now appears the local management had already decided to reject Kate – because she had the courage to bring this initial incident to their attention. The opportunity to show a more inclusive, enlightened and progressive approach to LGBT people was to be squandered, because of their embarrassment, awkwardness and uncertainty about the best way to handle things. Kate’s approach at this helpful, low-key meeting was untruthfully misrepresented some weeks later by the RNLI as ‘highly reactive’ and used as the spurious excuse for Kate’s rejection. It certainly was nothing of the sort. It was an amicable meeting on all sides, from which much good might have come, if only the local management had known how to proceed in a mature and sensible way. Kate’s rejection as a volunteer was despite the fact that, as a retired full-time classroom teacher for 15 years and a Tours and Talks Guide with the National Trust for 7 years, she was very well qualified and had plenty of experience of talking to the public, regularly giving talks to groups of up to 40-50 people. Although she was giving up her spare time for free, rather than giving her a chance to prove what she could do as a volunteer to help them with their educational work, they said they didn’t even want her to start. Kate and her wife Jane were flabbergasted – very shocked and upset. Jane had also volunteered to help them, but they say in their final response to us that they have not rejected her – could this be because she is not transgendered herself, just married to a transgendered person? Apparently that’s okay, they just don’t want any LGBT people in person as volunteers. To protest against this unlawful discrimination against Kate, please contact the RNLI as below and add your voice, so these bigoted and unenlighted people don’t get away with it. And in case anyone thinks that the RNLI should be a ‘protected’ charity which one should never criticise, and how dare I bring this to the attention of the public through social media, let me state clearly now that I do appreciate the wonderful work done by the RNLI in rescuing folk from the sea, and the last thing I want to do is distract the RNLI from their valuable work in this regard. However, under the Equality Act 2010 it is unlawful to discriminate against anyone for reasons of gender, sexual orientation, race, ethnicity etc., and they need to be made accountable and brought to book for this. The RNLI Lifeboat Station in Burry Port, near Llanelli, Wales, is a very nepotistic institution. It is largely run by a closed-shop of the same local families, who treat it as their personal fiefdom, to do with as they wish. To judge by the attitude of their Operations Manager, they are small-minded and intolerant of diversity, keeping out anyone who may not fit into their restrictive ‘macho’ image of themselves. There is only one woman member of the crew out of 21, and she belongs to one of the local families which dominate the station. Unfortunately I have three ‘strikes’ against me – I am English, I am transgendered, and I am not a Bowen, a Griffiths, a Morgan or a Williams. Please read below, and then please do support me in my campaign against these bigoted troglodytes, who are still living in a previous century. If you wish, you can read the full transcript (see link above) of ALL correspondence with the RNLI – which makes interesting reading, showing how hard we tried to make the RNLI see sense. Please support me by expressing your disgust with how the RNLI have treated me both at the local and national, headquarters level. Write to, email or phone the RNLI people concerned. If enough folk contact them, maybe we will finally get the RNLI to respond as they should have done to the unlawful transphobic discrimination to which I have been subjected. The RNLI claims to be a ‘Stonewall Diversity Champion’ – what a joke! Mr Bowen lied about what was said at our meeting with him and Trevor Griffiths on 16th June; misrepresented the facts and failed to acknowledge or admit to any of the discriminative comments he made, subsequently inventing a spurious and untruthful excuse for my rejection as an RNLI volunteer while denying the true grounds, which were based on transphobic prejudice. Trevor Griffiths – Chairperson Local Management Group (L.M.G), Burry Port Lifeboat Station (Took seven weeks to write a letter in response to our complaint, but denied what had been said at our meeting with them on 16th June). (The following contact details are publicly available on the RNLI Headquarters main website and linked webpages). Inclusion & Diversity Officer: Susan Kingswood (Did very little in spite of her title and went off on holiday).